An excellent way to transform your home is with stylized custom made furniture. And still quite trendy is the streamline and uncluttered look. In fact, many designers predict that a simplified look is here to stay for a long while. Among the uncluttered styles include oriental inspired sophistication. As it happens, utilizing Zen furniture and Zen designs are a fabulous way to beautify your home with the latest trend. Truthfully, Japanese style furniture will create an ambiance of peace and serenity that allows you to relax when needed and keep focused. There are several ways to add to your décor in order to create a peaceful and serene Japanese ambiance. With a vast array of concepts and a few customized Japanese pieces, your living space will be transformed into a dream home. The Japanese culture is often focused on the respect for Mother Nature. And in order to keep connected, a touch of nature is brought indoors. There are many Japanese plants that can be added to your décor such as bamboo and bonsai. In fact, there are numerous types of bonsai plants like weeping fig, the Umbrella tree, Myrtle, Azaleas and even citrus trees. You will be amazed at how a few plants here and there will liven up your living space. Also, plants add extra oxygen to the air that keep you refreshed and revitalized. One of the best ways to add a display of plants is with a customized planter. For instance, bonsais can be displayed in a low container or arranged into mini landscapes. You can also have a several matching planters scattered throughout a room. And if Japanese plants are unavailable, any type of greenery will work. The secret is to keep it simple and organized into customized planters. Adding wood elements to your décor is important when referring to Japanese interior design. According to tradition, wood adds harmony and balance. Wood also represents flexibility and strength. It is often associated with idealism and generosity. Some of the best ways to add wood to your home is with Japanese furniture. You can also add wood to your walls, flooring and with additions like wooden room dividers. An inexpensive way to add wood to your décor is with wood furniture legs. 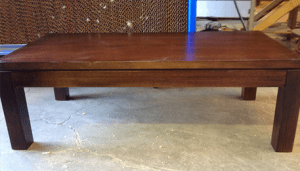 Adding wooden legs to your furniture is also a great way to update an old piece. Furthermore, wood is durable, adds value and aesthetics plus it never goes out of style. One of the best places for wooden furniture legs in the Melbourne area is at Peter Ross Enterprises. They have a vast selection of wood furniture legs that can transform an old piece of furniture into a stylized and simple piece. In fact, Peter Ross Enterprises specializes in furniture legs and also has expert knowledge in custom-made furniture. Most Japanese homes are very simplistic and not jammed packed full of furniture. As well, the majority of pieces are multipurpose or low to the ground. You can simulate Japanese elegance with many types of Japanese style furniture. For instance, your dining room can have the traditional low to the ground table with several comfy floor cushions. You can also streamline your living room by consolidating the media center. Custom made cabinets with a Japanese flair can add a whole new ambiance to your living room. Equally, a media center that serves as a book shelf and display case will eliminate the clutter in the room. Whether you desire an authentic look or you want a combination of East and individual design, Japanese style furniture can be unified into your home quite easily. © Copyright 2017. All rights reserved by | » Oriental Inspired Sophistication with Japanese Style Furniture for your Home Peter Ross Enterprises Melbourne | Website Designed by: Netwizard Design.